First and foremost, the best shaver for traveling must be reliable. It should also be compact enough to pack away, have a protective cap, and be easy to use overall. We addressed these factors and more when creating the top list below. You don’t want personal grooming habits to slip while traveling, so a quality portable shaver is a must-have. 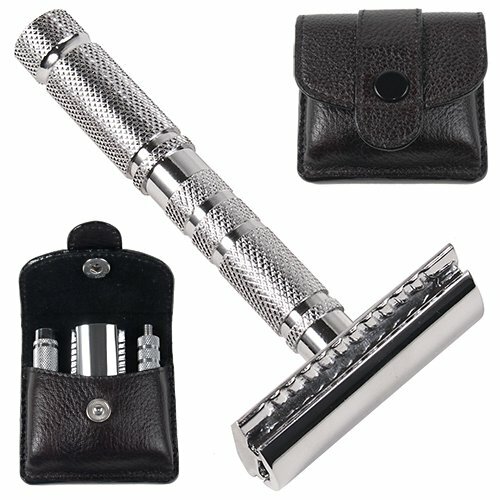 Many opt for electric ones in this case, but there are manual razors that do the job as well. No matter which type you prefer, we came up with seven top products to help you find the best travel shaver that’ll suit your needs. 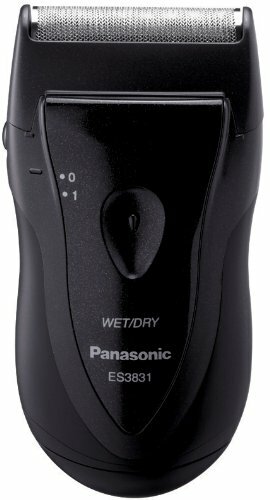 The Panasonic ES3831K is seen as the best travel shaver thanks to its many features. It has a compact build for greater portability, while it features an ergonomic, contoured design for simple holding. The shaver comes with a plastic cap that easily attaches/detaches, and it also has a soft travel pouch for additional storage with your bags or luggage. For the actual shave, this uses a floating single blade system. It is placed with an ultra-thin, stainless steel foil. When working together, they are able to conform and contour to your face to provide a closer shave. Not only is it 100% waterproof for easy cleaning, but it also has wet and dry uses so you can use this however you prefer. Even though there does not appear to be a lock for the switch, the shaver is powered by batteries you can readily replace. 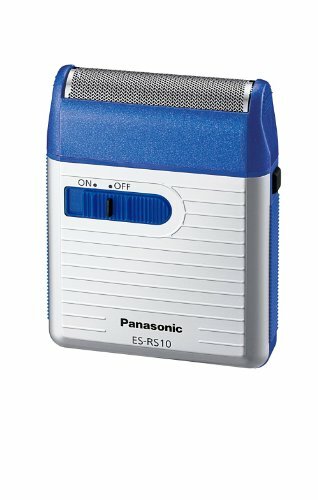 Just about anyone can use this Panasonic Travel Shaver, both beginner as well as more experienced shavers. Next on our best travel shaver list is the Ceenwes Electric Razor that is small enough to fit in just about anything you travel with, and it even comes with a carrying pouch to keep it tucked away by itself. Additionally, it comes with a cleaning brush so you can keep it looking like new longer. Although it may sometimes lead to an inconsistent shave, the razor’s dual, self-sharpening blades can still cut rather close in order to give you the finest of hairs. To protect the blades while you travel, beyond using the traveling bag, this shaver has a plastic cover. This simple razor can manage to give you almost as good of a shave as your home electric shaver. It may take some more time though considering it’s slower, so it helps if you aren’t exactly in a rush. As it’s powered by batteries, it’s more convenient too as it removes the need to charge. People that are traveling and want a battery-operated shaver. 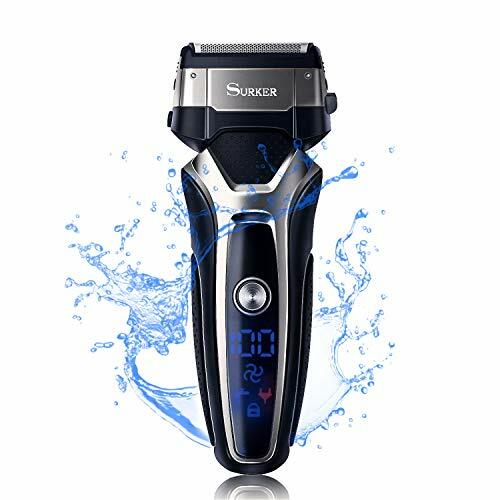 This Surker Electric Travel Shaver is the best travel shaver when it comes to convenience and portability. You can use it both corded and cordless because you can charge it through a USB. After a 90 minutes quick charge you can enjoy 90 minutes of constant use. Moreover, it has a non-slip grip that makes it easy to handle and grab. 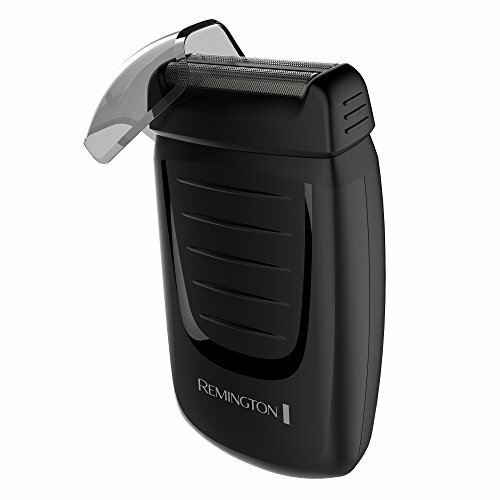 When it comes to the shave itself, this device offers both a comfortable dry and a refreshing wet shave with shaving cream or gel. But be careful when cleaning it, use only water, no bleach or other strong chemicals as it may damage the shaver. It is great for traveling thanks to its lock for travel guard. Both new and old to shaving with an electric device, offering bot wet and dry shave choices. Able to provide a great close shave and offering excellent portability, the Parker A1R is seen by many as the best travel shaver. One of its defining features is that it disassembles into three pieces. Not only does this allow for easier cleaning, but it enhances its portability as you can place the pieces in a small leather case for transport. Overall, this feels like a quality shaver. It doesn’t come with an actual blade, however, but the razor head is similar to other Parker three piece razors so fitting one on should be no issue. This razor works best for those who have some shaving experience. This is due to the fact that because you can get a closer shave, you need to take extra care. It’ll also work better for those who want something that can be used both when traveling and at home as well. This Panasonic shaver is excellent when traveling, even though it does not offer the same level of satisfaction that a full-size electric shaver offers, it’s compact design is most fitted when traveling often. It has a hard plastic shell to protect the flimsy screen and can be best carried in your toiletries bag. It does not take a lot of space due to its size, however, it can be tough to hold onto. This works great to trim your mustaches or your beard when traveling. Even though this is a small device, it is tough built and quite powerful. Also, the battery life is quite good depending on the batteries you use with it, of course. Moreover, for safety reasons, the on switch needs to be also pushed down as you slide it to on, thus preventing the shaver from turning on as it gets jostled around in your luggage. People that travel very often will benefit most from this compact Panasonic shaver’s abilities. 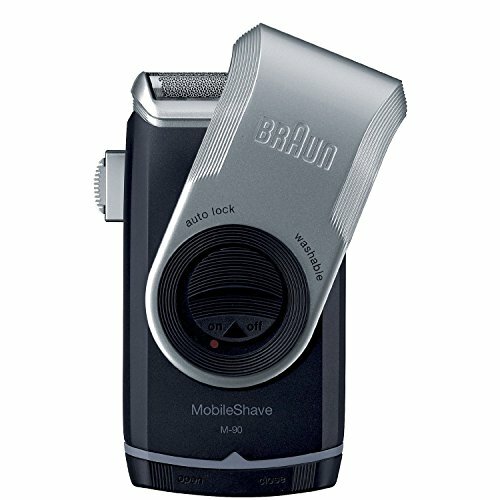 For a close and comfortable shave, while on-the-go, the Braun M90 goes to work utilizing wide floating foil. It can give you that freshly groomed appearance when you need it quick. In addition, there’s a side trimmer that stays out of the way until you need it. All of this is done in a sleek, compact size. It’s easy to maintain this shaver so that it lasts longer. The shave is water-resistant so it’s simple to clean under running water. Also, it has a cover and a locking mechanism to prevent it from accidentally turning on in your bag. Moreover, it has a long hair trimmer to help with precision trimming of mustaches and sideburns. Powered by two replaceable batteries, the Braun M90 can benefit those seeking functionality without the use of a plug or charger kit. It’s also ultra convenient to the point that you can use it in the car if you want to. This Philips Norelco PQ208/40 has a small, lightweight design so you can slip it into any bag. It also has a protective cap to keep the blade safe while it’s packed away. With that said, the protective cover may not always stay on, so it helps to take caution when placing this in a bag with other items. For the actual blade, it is a rotary type. It’s engineered to provide a close shave, and the blades are even self-sharpening to prevent wear. However, achieving a close shave does take a good deal of time, and the timing can change depending on the batteries. It’s rather straightforward to clean (assisted with the provided cleaning brush), and the battery life lasts a couple of months depending on how often it’s used. 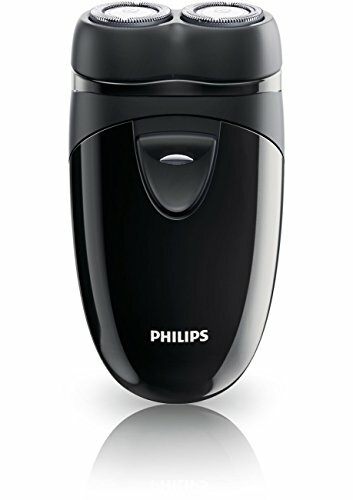 As a top contender for the best travel shaver, this Philips Norelco Razor is easy for first-timers to use. When you’re on-the-go, it’s good to have a reliable razor that can you can touch up without having to lug around your home shaver. The best travel shaver should ultimately be easy to pack and use. We have also compiled a list of the best safety razor travel cases to come in handy to you. Have you tried any of the travel shavers mentioned in our review? Let us know all about it in the comments below.